The search is on for thieves who posed as water workers and stole nearly $1,000 from an elderly woman in Warren. According to police, it happened at about 1:40 p.m. on Tuesday. The two men, posing as Warren City Water Department employees, knocked on the door of an 86-year-old woman and told her they were investigating a water leak behind her home. She allowed the men inside, and they walked around testing faucets. 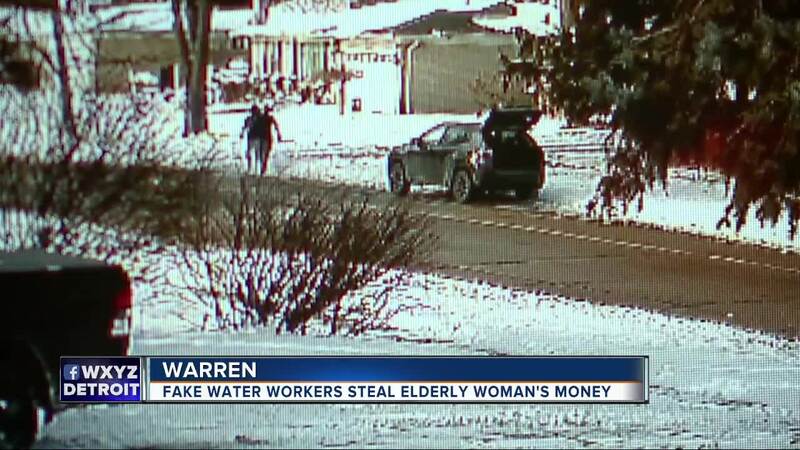 WARREN, Mich. (WXYZ) — The search is on for thieves who posed as water workers and stole nearly $1,000 from an elderly woman in Warren. According to police, it happened at about 1:40 p.m. on Tuesday. The two men, posing as Warren City Water Department employees, knocked on the door of an 86-year-old woman and told her they were investigating a water leak behind her home. She allowed the men inside, and they walked around testing faucets. Eventually, the men told her it would cost about $1,800 to replace the pipes, and the woman retrieved an envelope containing cash and hid it behind a couch cushion. After she told the men she didn't have the money, they left, but she noticed the envelope that was hidden behind the couch was gone. The woman described both men as white males between the ages of 35 and 45 with average height and medium to stocky build. Surveillance showed the men driving west on Masonic in a newer, dark-colored SUV, likely a 2018 Jeep Compass. ”I’m outraged by this despicable and downright disgusting crime against an elderly Warren woman. This is a crime that attempts to take advantage of an elderly trusting resident," Mayor Jim Fouts said in a release. "I urge residents especially those with elderly relatives to make sure that they caution against allowing any person posing as a Warren employee into their home. I place a high priority of zero tolerance involving crime against our elder residents." They are offering a $1,000 reward to anyone who has information leading to the arrest.